Feeding Honey Bees Sugar Water – Updated! Mixing sugar water for bees is one of the first tasks most new beekeepers attempt. Feeding new colonies can mean a big boost in development. But, you need to do it right to avoid problems. 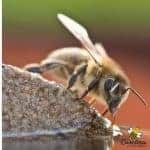 Each year thousands of beekeepers invest time in feeding bees sugar water. And, it’s not just the time involved but the money as well. So there must be a good reason that beekeepers do this, right? But wait a minute, bees collect food from flowers, why would anyone want to spend time feeding bees sugar water? Well, there are several reasons for that approach. The concept of feeding honey bees sugar water often creates a division among beekeepers. Some beekeepers feel that you should never feed bees, period. They feel that honey bees should be able to make it on their own. Other beekeepers accept the need to feed their honey bees when conditions warrant. There are different ways to feed bees and all have advantages and disadvantages. This is one of the newer types of hive top feeders. I believe this would be especially helpful for new bee colonies in the Spring that need a lot of feeding or Fall colonies that are not ready for Winter. Top feeders can be messy if you need to get inside the hive to inspect often. But their advantage is that they hold a lot of food. I do not believe that bees are lazy or that feeding bees will prevent them from foraging for nectar. Some bee hives will need to be fed and some may never need it – depending on local conditions. Lets look at the concept of feeding honey bees sugar water and the equipment needed to do a good job. Why Feed Your Honey Bees Sugar Water? There will be times when your honey bee colonies will need your help to survive. I am not saying that you need to feed every hive all the time. If this is the case, something is wrong. But some colonies may thrive with a little boost occasionally. This is especially true for a new hive. A bee package (or a captured swarm) arrives on the scene with no resources. They have no comb, food stores, or brood . They have a lot to do before winter cold. Established colonies can usually survive on their own unless you are in a drought. New colonies need extra help. Each year, new beekeepers begin their adventure with beekeeping kits. Perhaps, they ordered the kit for themselves or maybe it was a gift. Beekeeping kits can be a good purchase – depending on the quality of items included. Beware of beekeeping kits that come with small jar feeders. The small feeders can be a hazard in the hands of inexperienced beekeepers and are better when used inside the hive not hanging on the front. 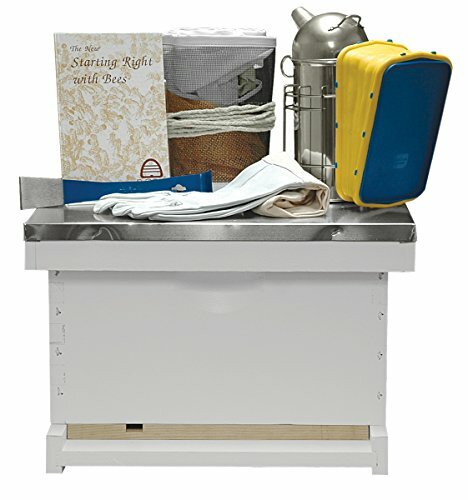 A kit without a feeder is a better value for most new beekeepers. Then, you can choose the style of feeder that you would like to use. Failure to feed your bees during the warm months, may leave you with hungry colonies in the fall. Cold temps may prevent your colony from becoming ready for winter. Quart jar feeders can be done with materials at home or you can purchase the jar holders. If made at home, sugar water is mixed well and poured into the glass jars. Using a small nail, punch several tiny holes in the metal jar lid. When inverted and placed on the hive, bees will access sugar water through the small holes. If placed directly on the top bars of the hive, you will need an extra deep box to enclose the feeder. Some beekeepers use a temporary hive top with a 1″ – 2″ hole in the top. (You can use a wide drill bit to do this. ) The upside-down jar is placed over the hole. Be sure to secure the jar to the hive in some way. i.e. Cover it with a plastic bucket and place a brick on top etc. We do not want the wind or a raccoon to push the jar over. Of course, you can also use an empty deep box (with a top) to enclose jars inside the hive. One easy way to use jar feeders is to purchase or make 4 jars feeders. Place all 4 inside the hive – sitting on the inner cover. Use an extra deep hive box to enclose the jars and them put the top back on the hive. This allows the bees to have access to a gallon of sugar water inside the hive. Nectar availability ebbs and flows in most areas. It is subject to climate conditions such as drought or a late freeze. Strong winds, cold temperatures or rain can affect foraging conditions. Too little food during Spring build up causes the bees to sacrifice brood (young). Poor foraging conditions in the Fall prevent storage of food for Winter survival. The bottom line is that we cant always rely on natural nectar. This is especially true because we keep more hives in a one area than you would find in nature. Let’s talk about package bees. The majority of new bee hives established each year begin with package bees. This small wooden and screen box contains about 10,000 bees and a queen. Other than a small can of sugar water, the bees have no resources but themselves. Experienced beekeepers often freeze excess frames of honey. These are fed back to colonies at a later time. Unfortunately, the new beekeeper does not have this option. Feeding honey bees sugar water is necessary in most areas. Checkout my post on why package bees need fed : here. I prefer sugar water made with pure cane sugar. Avoid powered sugar, brown sugar, molasses etc when feeding bees. These sugars have indigestible components that can make your bees sick. If the bag does not say pure cane sugar, it probably is not. You should be able to find pure cane sugar in your local grocery but you can order it if you prefer. 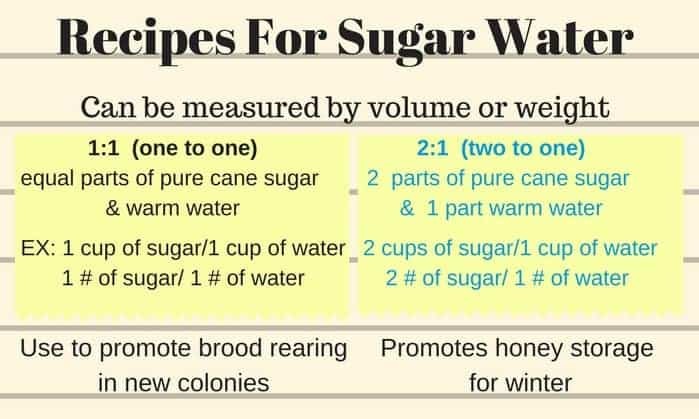 This chart gives basic recipes for feeding honey bees sugar water. Scroll down for a printable guide. There are 2 basic formulas used by beekeepers for feeding honey bees sugar water. We call them 1:1 (1 to 1) and 2:1 (2 to 1) ratio. Let’s break this down because to a new beekeeper it can be so confusing. You can measure by weight or volume it does not matter. New colonies are fed 1:1 to encourage brood rearing. 2:1 ( 2 parts sugar to 1 part water) is used in the fall to encourage storage of food for winter. Sugar water honey will keep your colony from starvation but it is not real honey. A golden rule to remember when feeding bees sugar water. Never feed bees when honey supers on your colony are meant for human consumption. Many beekeepers use a feeding supplement in their sugar water. 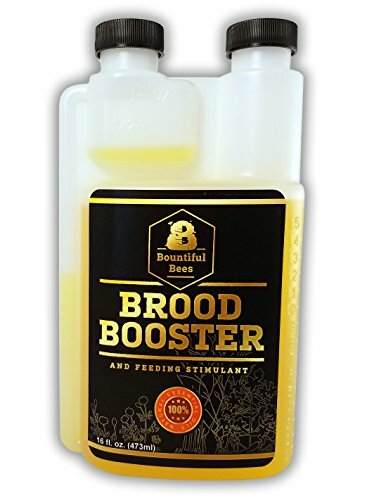 It promotes good feeding and prevents your syrup from becoming moldy. Containing essential oils, these products are reported to promote good health in our bee colonies. They are concentrated and the beekeeper would add only a small amount to the sugar water. I have not used this particular one yet but I have heard good comments about it. A multitude of feeders are available for feeding honey bees sugar water. Each type or method has pros and cons. Lets explore the most common bee feeders. 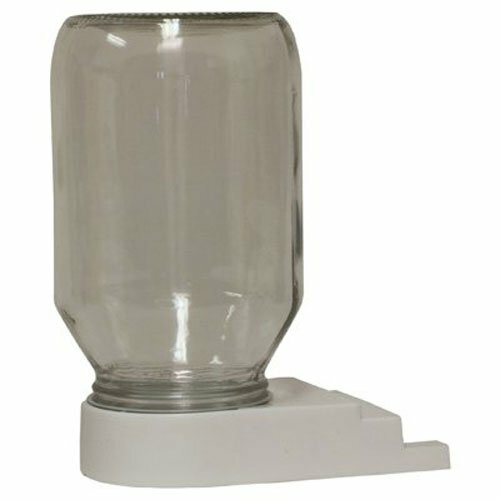 Use this feeder with a regular glass canning jar. It fits into the front hive entrance. A beekeeper can easily see when to refill. This type of feeder does have its problems. It does not hold a lot of sugar water and will require refilling often. The smell will attract wasps and bees from other hives to the entrance. This may result in fighting and robbing. If you want to use a boardman feeder, place it inside the hive. The entrance feeder can be placed on top of the frames needs an empty box around it to close up the hive. You can use several feeders at one time! is their tendency to leak over time. They are also heavy when filled and care must be taken to avoid spilling syrup around the hive. A frame feeder takes the place of one frame in the hive body. Most frame feeders hold approximately 1 gallon of syrup. Being inside the hive, the bees have easy access to the food. Frame feeders have some cons. You have to open the hive to refill. And, you will always have some bees drown in the feeder. If you choose to use frame feeders, put some type of floating material inside. I have used small sticks or wooden Popsicle sticks to reduce bee drowning. The bucket feeder is one of the most popular bee feeders. A small round plastic bucket with a mesh feeder hole holds 1 gallon of sugar syrup. (You will also find larger styles available.) Fill the bucket with sugar syrup. Put the lid on tightly. When you turn the bucket upside down, some syrup will escape until a vacuum forms. Put the upside down bucket directly on top of the frames. Bees will feed from the mesh feeder hole in the bucket ( or small holes drilled by the manufacturer). Like the boardman feeders, this method requires extra equipment. An empty hive body around the bucket allows the hive to be closed. If you choose, you can use a temporary hive top with a small hole drilled in the center. Place your upturned bucket over the hole. A brick or rock on top of the bucket will prevent wind damage. Refilling the bucket can be accomplished easily without disturbing the colony. And no drowned bees ! Outside feeding is interesting to watch but it causes frenzy activity. Never use outside feeders near your hives! The biggest mistake made by new beekeepers is failing to feed a new colony long enough. Feeding honey bees sugar water can not have a set time frame of when to stop. When bees first arrive, they are hungry and feed heavily. In a few weeks, a natural nectar flow may occur in your area. A beekeeper who stops feeding in April may find a surprise in the September hive. No food stores for winter and frames that do not have honeycomb drawn out are common. The new colony full of potential in the spring now faces starvation. The moral of this story is feed your bees. If they lose interest in the sugar syrup, remove it for a few weeks. Then offer a small amount of food. If they take it quickly, you will know it is time to start feeding again. 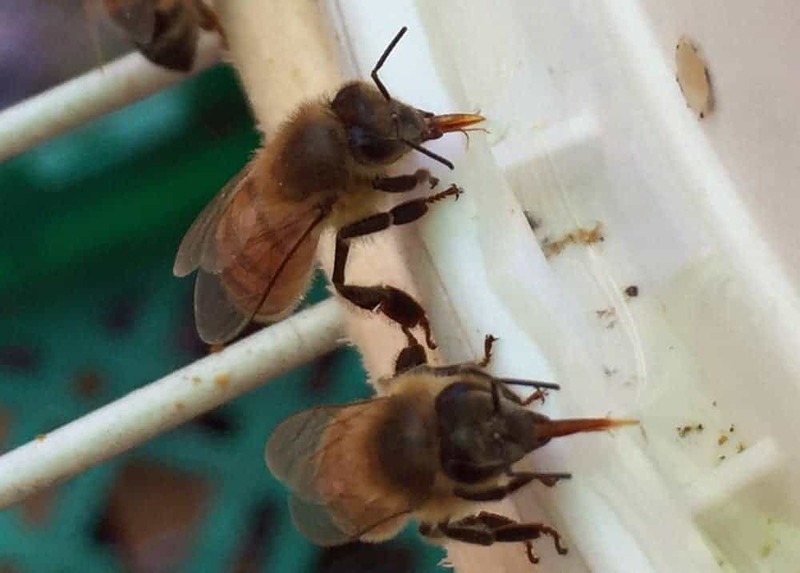 When to Stop Feeding Bees Sugar Water? The simple answer for my bees is : when they have enough comb drawn and honey stored for Winter. You should not have to feed bees all the time. We want to step in when help is needed and help new colonies. But feeding all the time can cause other problems and its expensive! I love my bees but they are all little “robbers and thieves” . Especially during times of a nectar shortage or complete lack of nectar (we call that a dearth)you may experience robbing. The stronger or more aggressive hives with fight the weaker hive and steal honey(sugar water). Once this begins it is difficult to stop. If you see a fighting frenzy at the front of your hive, cover the hive with a damp towel. The towel hanging down loosely over the entrance of the hive tends to calm the situation. If that is not successful, I have turned a water sprinkler on the hive for a few hours. Robbing is best avoided. Be vigilant when feeding bees, keep entrances small enough for the colony to defend. If a small colony, entrance should be only about 1 inch, a larger colony of strong nuc can have a bit larger opening. Feeding bees is a lot of work and expense. How much you need to feed will depend on your climate and foraging conditions. This is another example of why it is important to connect with local beekeepers. Thanks very informative always wondered when to stop feeding .. Old hive had swarm queen cells– I split/ two bottom deeps with queen excluder on top added two mediums w/ another queen excluder and another two shallow w/drawn frames. Why does feeding sugar water to a colony make the honey unsuitable for human consumption? Its important to match the size of your hive (space inside) to the population of the colony. Unless you have alot of bees that sounds like alot of space for them to protect. After splitting a hive, always check in a couple of weeks to see if you have a laying queen in each part. Feeding sugar water while your honey collection supers are on will result in bees making sugar water honey. Real honey contains enzymes and all kinds of neat things left over from the harvested plant nectar. Sugar water is as close to honey as we can get for the bees but it is not really honey. Feed bees when you need to but not when the supers are on for your harvest. We have a new hive (local cut out) that is trying to produce a queen. They are eating a quart of 1:1 sugar water in less than 24 hours. The other two hives (Italian, with queens) are not eating their water that fast. Could the new hive be getting robbed even though there is still clover and they sugar water available to the other bees? They could be, do you see fight and wrestling at the front? Also, since their hive life has been disrupted by the cut out and move, they may not be taking advantage of the local nectar as well as the others. I would make sure the entrance of the cut out hive is reduced some to help them protect against robbers. We had our colony collaspe. I am having to give sugar water. The bees are going through a quart jar in two hours, should I be giving more. Sandra, Usually when we say that a colony has collapsed it means it is dead. So I’m thinking that you have a weak colony or one that is low on food. What do to depends on where you live. It is 27 degrees at 3 PM in my area right now. But in general – when I am feeding bees that need fed, I would need more than a quart. Maybe use 2 or even 3 quarts at a time. I’m getting my very first package this weekend. I plan on using 1 gallon baggie feeders. My only concern is not being able to open the hive for the first 5-7 days. I’m not sure if 1-2 bags will last until I can open and check on the hive. I used to use gallon baggies and liked them quite well. But you are right, they are a pain if you need to do inspections. You must be using a shim? If you lay the bags on the top bars you need a shim to hold the inner cover off the bag. IF you are putting them on the inner cover, you need a shim to hold the top off the bag. A bag or two would be fine for 5 days and if you put them on the inner cover you might be able to carefully move it (and them) in a few days if you need to. I am a newbie with a tbh and my bees are a new package (1 mo). I live in N TX and they are still going through a quart every 2 days. I’m told when they lose interest to stop, but they are not losing interest even though they are drawing comb like gang busters! I don’t know if I should drop down, stop and see or continue. I’m not concerned with human consumption, just keeping them fat and happy until something changes. They are great foragers and there is a lot of pollen comb. Should I continue for now? I would continue. A tbh is a bit different – I dont know how much you need for Winter in your area. But since this is a new package of bees, I would not be quick to remove the feeder, especially since everything seems to be going so well. Hi charlotte and hi to all beekeepers. I am a new beekeeper. From algeria (north africa). I bought seven hives last year ( 2017) and i want to get good honey this year(2018) for human consomption. This year ,the winter is long,it means , we are in june and still have rain and cold days. So please, can i give them some sugar water just to est it not to store it? If yes, how much the ratio of sugar In water that must not be exceed juste to eat it. Know that i stopped feeding them. Local conditions are important. You can feed the bees anytime that you do NOT have boxes on for human consumption. Many factors can cause problems. Lack of forage, problems with your queens, mites or other pests. This is my first year for keeping bees. I live in rural North MO and discovered a colony in a tree not too far away from my home. I decided to set a swarm trap in the trees behind my house and attempt to catch a swarm instead of buying a nuc or package. I started feeding sugar water in my back yard with the idea that it would promote a rapid spring built-up in the bee tree and they would need to swarm out. They were taking 2 qts of 1:1 a day! It must have worked or they did so naturally, who knows, I caught a swarm in the trap on my first try and now I have a new hive. I successfully transferred them to a hive on the 18th of June. A local bee keeper told me I should now stop feeding and let them do their own thing. He believes that sugar water will sit in the cells and go bad unless it is treated. Because it was very cold through mid May and we have had very hot and dry conditions here for early summer I am still feeding them and added a protein patty to boot. I fear that since they have gotten a late start in the season they are at a disadvantage and might not be able to sufficiently build-up their numbers and stores before winter. I will feed them this way all summer if that’s what it takes for them to survive. Is it factually true that sugar water stored in the cells will go bad if it is not treated before feeding? After I transferred them I put a qt jar of sugar water with punched lid upside down over the hole of the inner cover protected by a deep box and lid and left it there for about 4 days. I thought that maybe that was too long for it to be used without it going bad, so I change it out with a fresh jar. This afternoon when I checked on them I noticed crawlers in front of the hive. I counted a couple dozen of them. Have I made them sick from the sugar water or could the colony they came from have been sick in some way? They seem to be very lively, even a bit defensive. As a result of my own stupidity I have been stung by them twice already. You can rest easy as your sugar water would not have caused any problems with your bees. In fact, once the bees take the sugar water in and begin the conversion process to honey, you have no worries about it spoiling. 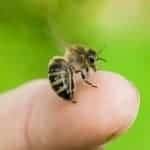 While honey made from sugar water will not contain all the essences and micronutrients of honey made from plant nectar, it will not spoil in the comb more than any other kind. If they were mine, I would continue to feed as much as they will take it because they have a lot of work to do before winter. The crawlers you are seeing as most likely a result of mites (viruses) etc unless a few happened to get into a pesticide. There is no reason to feed with honey supers on for you. It would not be real honey. Bees make honey from plant nectar. They will convert sugar water into a honey-like substance but it wont be real honey. Do they have enough comb built and honey filled for the Winter? Here in SC, I tell my students to feed their bees until that goal is accomplished. Your local forage will factor in of course but in my area, a swarm that is not fed doesnt have a good chance of being ready for Winter by October. How much honey you took is not as important as how much you left. In my area, I have no Summer/Fall flow. Local conditions where you live will determine 1)How much honey your bees need for Winter and 2) Will there be enough forage out there for them to get what they need. I dont take any honey until my bees have one full shallow for themselves. How much you need to leave will depend greatly on your location. Hello, I live in Georgia and we have had a very wet summer. Can a lot of rain affect honey production? I have checked my hive and there are lots of bees, but no honey. I am in a neighboring state, Ft. Bragg, Nc area. I enjoy reading your posts on bees. Very informative. Haven’t read all but working on it. I am a second yr bee keeper. My 1st year didnt work out so well. 3 packages and a swarm. They either died or absconded. Also the fact that my job was keeping me on the road 99 percent of the time didnt help either. Along with someone who was also a new bee keeper taking honey from them, the winter stores I’m guessing. But I was not discouraged,. I started over with 1 package and 2 nucs. And so far so good. As I was told when I got my nucs, be nice and give them a Christmas gift, a sugar patty also a valentines gift….lol. The winter stores will be left alone this time, being I am here permanently now. I am still feeding sugar water, 1 to 1 mix, in half gallon jars on boardman feeders. So my question is, should i stop feeding during winter mths, since the colony will downsize by kicking out the drones, and just keep an eye on their stores and feed them as needed or keep feeding as long as they are taking it. Absolutely, my bees dont fly very much in the rain. Also, sometimes the rain will wash nectar out of the bloom. Do you subscribe to my newsletter? Would love to have you. We want our bees to have enough honey stored for winter well before Winter arrives. Feeding in winter should only be an emergency or extra precaution plan. So, I suggest – decide how much honey (how many boxes etc) bees need in your area. Feed the bees until you have that amount of stores. Dont forget to manage mites. I leave ventilated bottom on all year. If we have a really cold front in Winter. 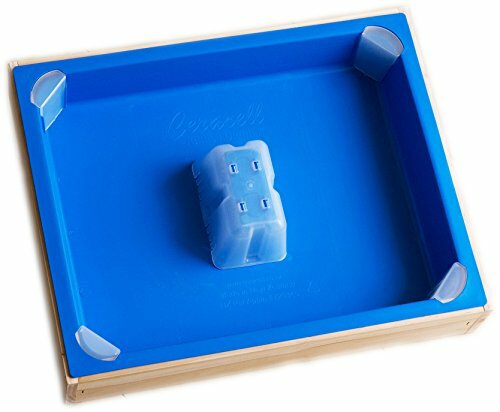 I slide the grid boards inside. Is it OK to open feed 1/1 mix this time of year? With the Hurricane last week I am starting to notice some robbing . Most of the goldenrod that was blooming has been affected and bees are feeding very aggressively on my 5 gallon bucket feeders I started yesterday. Sure its okay, and you may consider setting up several 2 gal (or 1 gal buckets) instead of just 1 . Spread the population around. Hi. I started bee keeping this past April. I fed sugar water and all seems to be going great. I added a second deep body when they appeared to require it. I did not add a honey super as I wanted the bees to have enough honey for winter. I stopped feeding sugar water in late August. My question is when should I start feeding again. The bees and I live in North Central Texas. Buddy, it is VERY climate dependent. Ideally, you would not have to feed an over-wintered hive that still has plenty of honey stored. If your bees have enough food to last until your “flow” starts – you dont have to feed unless you want to encourage them to build up brood. Of course, don’t feed once you add a box for you. I have a robust hive of Carnolian bees entering its third Spring. They made it through a colder than normal Kansas City winter. This Spring I am going to be starting a 2nd hive right next to this first hive. I will be getting a 5 frame nuc of Minnesota hygienic Italians at the end of April or early May. With a new hive placed right next to a robust established hive any suggestions to minimize the chance of robbing? Sure thing, start off with the entrance greatly reduced and keep it small until the smaller one builds up. Consider sharing brood and giving the nuc a few frames of capped brood from the other hive – that will equalize their strength. Thank you for all the great information. I have only been on your e-mail list for a few weeks but have learned a lot. My bees for two hives arrive this Saturday. I think I have everything ready. I am so excited. Thanks so much David! It is going to be a very exciting day! Make a plan, have the stuff you need gathered and have fun.